Avidius Cassius was nominally the governor of Syria, but Marcus had delegated greater authority to him. Dio goes on to say that, while Avidius Cassius was mulling over Faustina's suggestion, he heard a rumour that Marcus was dead. He sprang into action, and claimed the throne. He soon learned that Marcus was not, in fact, dead, but, nevertheless, pressed on with his claim, and prepared for war. Cassius' challenge was short-lived however. He was murdered before Marcus could engage with him. “In the second century of the Christian Æra, the empire of Rome comprehended the fairest part of the earth, and the most civilised portion of mankind. The frontiers of that extensive monarchy were guarded by ancient renown and disciplined valour. The gentle, but powerful, influence of laws and manners had gradually cemented the union of the provinces. Their peaceful inhabitants enjoyed and abused the advantages of wealth and luxury. The image of a free constitution was preserved with decent reverence. The Roman senate appeared to possess the sovereign authority, and devolved on the emperors all the executive powers of government. During a happy period of more than fourscore years, the public administration was conducted by the virtue and abilities of Nerva, Trajan, Hadrian, and the two Antonines [i.e. Antoninus Pius and Marcus Aurelius]. A bronze sestertius of Commodus, issued 184–185. The wall referred to by Dio was almost certainly Hadrian's Wall. Ulpius Marcellus secured a victory over the “barbarians of Britain” in 184. Commemorative coins were issued. 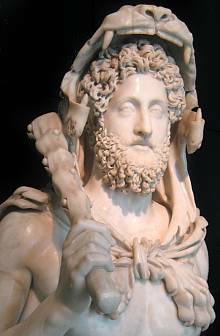 Commodus was acclaimed ‘Imperator for the seventh time’ and he adopted the title ‘Britannicus’. Perennis seems to have replaced the senatorial legionary commanders in Britain with men of lower rank. Perennis' death was in 185. To restore order in Britain, Commodus appointed Publius Helvius Pertinax as governor. Pertinax's ‘honeymoon’ was, however, brief. On 28th March 193, the Praetorians killed Pertinax. “The soldiers cut off the head of Pertinax and fastened it on a spear, glorying in the deed. Thus did Pertinax, who undertook to restore everything in a moment, come to his end. He failed to comprehend, though a man of wide practical experience, that one cannot with safety reform everything at once, and that the restoration of a state, in particular, requires but time and wisdom. He had lived sixty-seven years, lacking four months and three days, and had reigned eighty-seven days. Eventually, Didius Julianus made the highest bid – he also planted the idea in the soldiers' minds that Flavius Sulpicianus, being Pertinax's father-in-law, might be inclined to seek revenge – and so the Praetorians declared him emperor. “So toward evening the new ruler hastened to the Forum and the senate-house. He was escorted by a vast number of Praetorians with numerous standards, as if prepared for action, his object being to intimidate both us and the populace at the outset and thereby to secure our allegiance ... we pushed our way through the soldiers, entered the senate-house, and heard him deliver a speech that was quite worthy of him, in the course of which he said: “I see that you need a ruler, and I myself am best fitted of any to rule you. I should mention all the advantages I can offer, if you were not already familiar with them and had not already had experience of me. Consequently I have not even asked to be attended here by many soldiers, but have come to you alone, in order that you may ratify what has been given to me by them.” “I am here alone” is what he said, though he had actually surrounded the entire senate-house outside with heavy-armed troops and had a large number of soldiers in the chamber itself; moreover he reminded us of our knowledge of the kind of man he was, in consequence of which we both feared and hated him. ... The next day we went up to pay our respects to him, moulding our faces, so to speak, and posturing, so that our grief should not be detected. The populace, however, went about openly with sullen looks, spoke its mind as much as it pleased, and was getting ready to do anything it could. Finally, when he came to the senate-house and was about to sacrifice to Janus before the entrance, all fell to shouting, as if by preconcerted arrangement, calling him stealer of the empire and parricide. Then, when he affected not to be angry and promised them some money, they became indignant at the implication that they could be bribed, and all cried out together: “We don't want it! We won't take it!” And the surrounding buildings echoed back their shout in a way to make one shudder. When Julianus heard their reply, he could endure it no longer, but ordered those standing nearest to be slain. That exasperated the populace all the more, and it did not cease expressing its regret for Pertinax and abusing Julianus, invoking the gods and cursing the soldiers; but though many were wounded and killed in many parts of the city, they continued to resist. Finally they seized arms and rushed together into the Circus, and there spent the night and the following day without food or drink, shouting and calling upon the remainder of the soldiers, especially Pescennius Niger and his followers in Syria, to come to their aid. Later, exhausted by their shouting, by their fasting, and by their loss of sleep, they separated and kept quiet, awaiting the hoped-for deliverance from abroad. ... These were the occurrences in Rome. I shall now speak of what happened outside, and of the various rebellions. For three men at this time, each commanding three legions of citizens and many foreigners besides, attempted to secure the control of affairs – Severus, Niger and Albinus. The last-named was governor of Britain, Severus of Pannonia [Superior], and Niger of Syria. These, then, were the three men portended by the three stars that suddenly came to view surrounding the sun when Julianus in our presence was offering the Sacrifices of Entrance in front of the senate-house. These stars were so very distinct that the soldiers kept continually looking at them and pointing them out to one another, while declaring that some dreadful fate would befall the emperor. As for us, however much we hoped and prayed that it might so prove, yet the fear of the moment would not permit us to gaze up at them except by furtive glances. So much for this incident, which I give from my own knowledge. Severus had the Praetorians responsible for killing Pertinax put to death – the rest of the Guard were cashiered and banished from Rome. He replaced them with recruits from the ranks of his legions. * Severus then turned his attention to Niger. In 194, at Issus, in Cilicia (now in southern Turkey), the conclusive showdown took place. “But while this siege was going on, Severus, out of a desire for glory, made a campaign against the barbarians – against the Osroëni, the Adiabeni, and the Arabians. “Even though Niger had been eliminated, Severus considered Albinus still a menace. He now heard that this man, delighted with the title of Caesar, was acting more and more like an emperor; he was informed also that a great many men, particularly the most distinguished senators, were writing public and private letters to the Caesar, trying to persuade him to come to Rome while Severus was absent and occupied elsewhere. The fact is that the aristocracy much preferred Albinus as emperor because he belonged to a noble family and was reputed to have a mild nature. When he learned of these developments, Severus declined to initiate open hostility against Albinus and start a war with him since he lacked a reasonable excuse for such action. He thought it best to try to eliminate his Caesar by tricking him without warning. He therefore sent his most trusted imperial messengers to Britain with secret orders to hand Albinus the dispatches openly if they were admitted to his presence. They were then to ask him to meet them privately to receive secret instructions; when Albinus agreed to this and his bodyguards were not present, the messengers were to attack him without warning and cut him down. Severus provided them with deadly poisons so that, if the opportunity presented itself, they might persuade one of his cooks or cupbearers to administer a dose in secret. Albinus' advisers, however, were suspicious of the emperor's messengers, and warned him to be on his guard against this cunning schemer. Severus' actions against Niger's governors had seriously damaged his reputation; after forcing them through their children to betray Niger, as has been related above, and after making good use of their assistance, he put them to death with their children after he had got from them everything he wanted. His actions on this occasion clearly revealed Severus' despicable character. The efforts of Severus now led Albinus to increase the size of his bodyguard. None of the emperor's men was admitted into the Caesar's presence until he had first been stripped and searched for concealed weapons. Now when the messengers from Severus arrived, they handed over the dispatches to Albinus openly and asked him to retire with them to receive secret orders. But Albinus, suspicious, had the men seized, and, putting them to torture privately, discovered the entire plot; after killing the messengers, he prepared to resist his revealed enemy. It is hard to believe that 300,000 men fought at Lugdunum. Actually, it seems likely that the phraseology of Dio Cassius/Xiphilinus should be translated as “on the two sides” rather than “on each side”, that is to say, 150,000 men in total (A.J. Graham ‘The numbers at Lugdunum’, Historia 27, 1978). 150,000 men is still a massive number. To put it in perspective, the total British garrison at this time, three legions plus auxiliaries, would probably have been in the region of 50,000 men. Marcus' ‘Meditations’, a series of writings reflecting his philosophy, have survived and have been printed in English translations since 1634. Pannonia – bounded on its north and east by the Danube – comprised modern western Hungary, and parts of Austria, Slovenia, Croatia, and Serbia. Trajan (98–117) divided the province into Upper Pannonia, or Pannonia Superior (the north and west), and Lower Pannonia, or Pannonia Inferior (the east and south). Pannonia Superior was garrisoned by three legions; Pannonia Inferior by one. Faustina died soon after Cassius' abortive rebellion. Despite the story linking her with Cassius, and, indeed, other stories of disreputable behaviour, Marcus grieved her loss and honoured her memory in grand style – including renaming her place of death, a village called Halala, Cappadocia, in modern Turkey (she had travelled to the East with Marcus), ‘Faustinopolis’, and having her deified. Dacia: modern Romania (more or less). C.J. Mann, in a paper called ‘The history of the Antonine Wall – a reappraisal’ (Proc. Soc. Antiq. Scot. 118, 1988), proposes that the Antonine Wall was reoccupied from c.184, after Ulpius Marcellus achieved his victory, until c.195, at which time Clodius Albinus needed to gather forces to pursue his claim on the throne. Ulpius Marcellus is clearly named as governor in two inscriptions, and almost certainly in a third, fragmentary, inscription. All three are from Hadrian's Wall. In one inscription, from Chesters (the fragmentary inscription is also from Chesters), Marcellus is governor under “the Emperor”, singular, whilst in one from Benwell he is governor under the “best and greatest Emperors”, plural. It is now known, from the diplomas, that Marcellus was governor under the joint rule of Marcus Aurelius and Commodus, satisfying the Benwell inscription, as well as under Commodus' sole rule. It used, however, to be thought that (as, indeed, Dio/Xiphilinus seems to imply) Marcellus was not in Britain until he was sent against the “barbarians” by Commodus alone. In order to satisfy the need for more than one emperor in the Benwell inscription, another governor called Ulpius Marcellus, possibly son of the first, was conjured-up, serving in 211, under Caracalla and Geta. This fictional character may still be found in older publications. 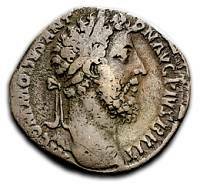 Septimius Severus hailed from Lepcis Magna, now in Libya. Up until this time, the Praetorian Guard had been manned only by Italians and citizens of the most civilized provinces. 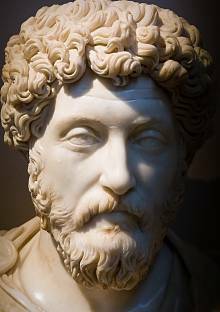 Attributed to the time of Marcus Aurelius and Lucius Verus is a shadowy figure, traditionally credited with bringing Christianity to Britain: King Lucius. At this time Virius Lupus was governor of Lower Germany (Germania Inferior). He would be the next governor of Britain. In Herodian's telling, the conspirators hatched their plot but a few hours before carrying it out, and Pertinax thought they had come to kill him when they had actually come to make him emperor. According to Dio/Xiphilinus, Commodus was fed poisoned beef. According to Herodian, he was given poisoned wine. Aelius Lampridius (‘Historia Augusta’) does not specify how the poison was administered.